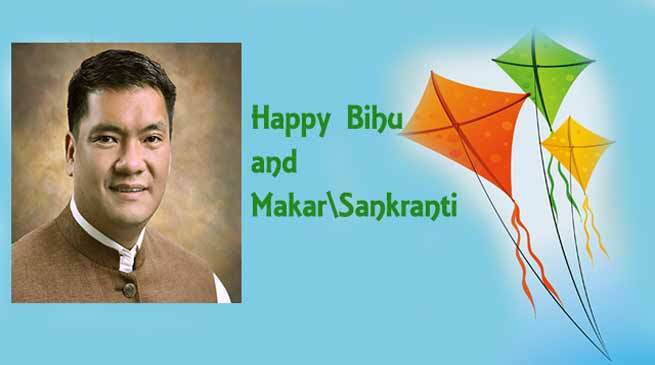 Chief Minister Pema Khandu has extended warm greetings on occasion of Magh Bihu as well as the holy festival of Makar Sankranti. In a message this evening, the Chief Minister wished the people from Assam on the joyous occasion of ‘Magh Bihu’ also known as ‘Bhogali Bihu’ that marks the end of harvesting season. “With the harvesting season coming to an end, let us relieve and thank the Almighty for a bumper harvest and happiness,” he said and expressed hope that the celebration would usher in a new year of happiness, peace and prosperity for all. The Chief Minister also greeted the people on the holy occasion of Makar Sankranti, which is celebrated by various names across the country.